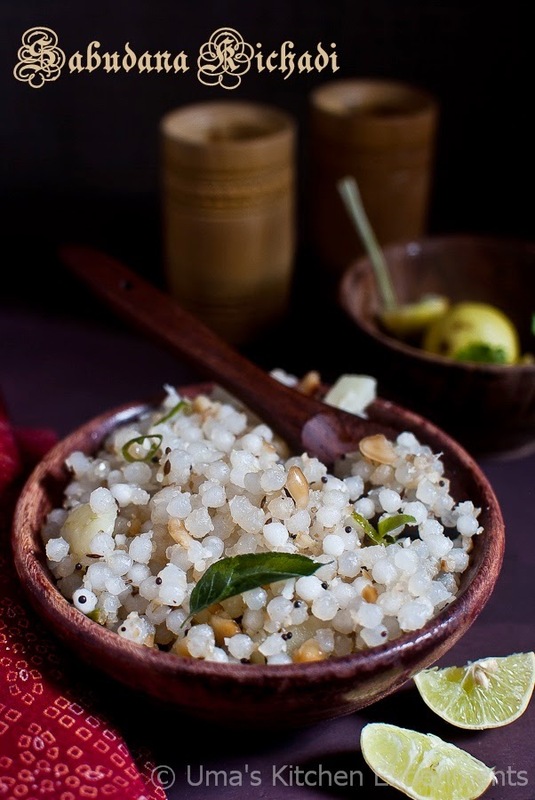 Like how prepare the semiya upma, we prepare sabudana upma too. It was one of our breakfast on earlier days when I started cooking. After being exposed to the food blogging, and the travel to various places of india due to my work, I came to know the similar kind of kichadi is being considered as one of the fasting food in several parts of India. 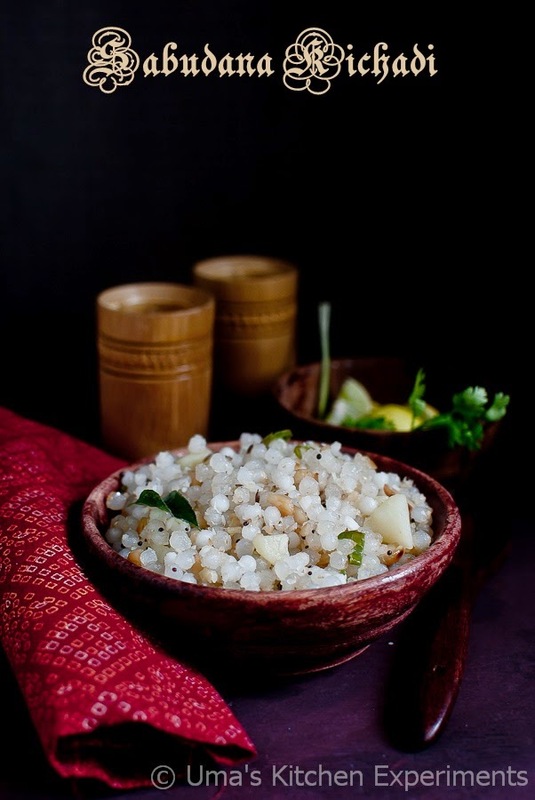 But my way of preparing it would be a very simple and like a plain upma without any vegetables and with onion. But I started making this kichadi later point of time with only peanuts. It is not because I like peanuts but for a change in our regular routine. I love peanuts(I am the exception from my family) and happily eat it in any edible form. My family dislikes it because of the slight sweetness it gives. Usually I prefer eating and like to include all kind of foods in my diet. Be it a raw salad or deep fried. These days I am not even buying sabudana not for any specific reason but only if it is required to prepare a kheer. I use the leftover sabudana for making this kichadi or vada based on the quantity I left with. 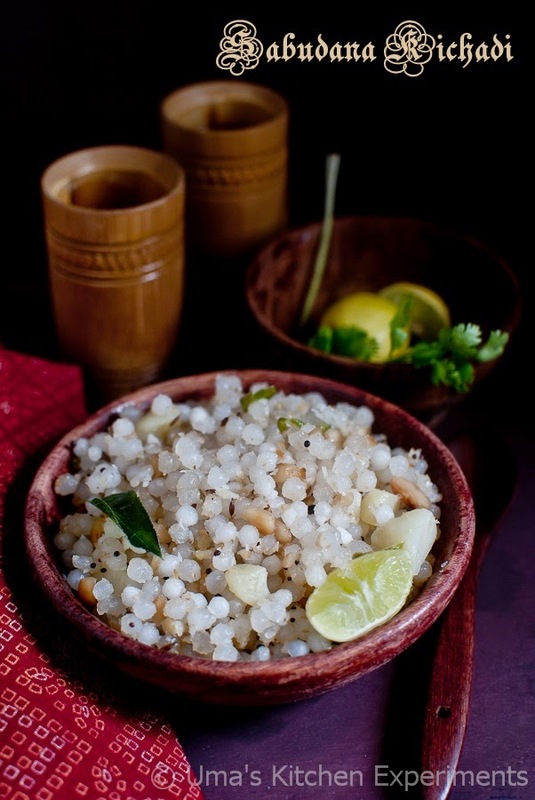 Sabudana kichadi is one of the fasting foods during the navarathiri days since it is a high calorie food. So, I though it is the right time to post this recipe. I make this kichadi without potato but my friend who is from Nashik suggested me to add the boiled, cubed potatoes to make it as traditional Maharashtra dish. But I have seen in various food blogs, the raw cubes potato is added at the initial step and cooked as a process of making kichadi instead of cooking it separately. Whatever maybe the procedure, it is up to the individual and one can choose either of this two method whichever is comfortable. 1) Wash sabudana in water for 2 or three times. Soak it in 1/2 cup of water or just above the level to immerse the sabudana. Soak it for over night or 5 hours. 2) In the next day morning, sabudana would have absorbed all the water and became slightly big. 3) Pressure cook the potato and peel the skin. Cut into cubes. Saute the peanuts in medium flame and peel off the skin. Pulse it to a coarse powder using mixie. 4) In a pan, heat oil. add mustard seeds, cumin seeds and curry leaves. 5) When all the added ingredients crack, add the green chilli. Saute for a few seconds. 6) Add cube potato and grated ginger. Saute till all incorporates well. 7) Add sabudana and sprinkle the salt evenly. Mix well and cook for few minutes. If the sabudana looks dry, sprinkle 2-3 tablespoons of water. Sabudana becomes glassy and transparent when it is cooked. Make sure to stir gently at frequent intervals to cook it evenly and to avoid burning at the bottom of the pan. 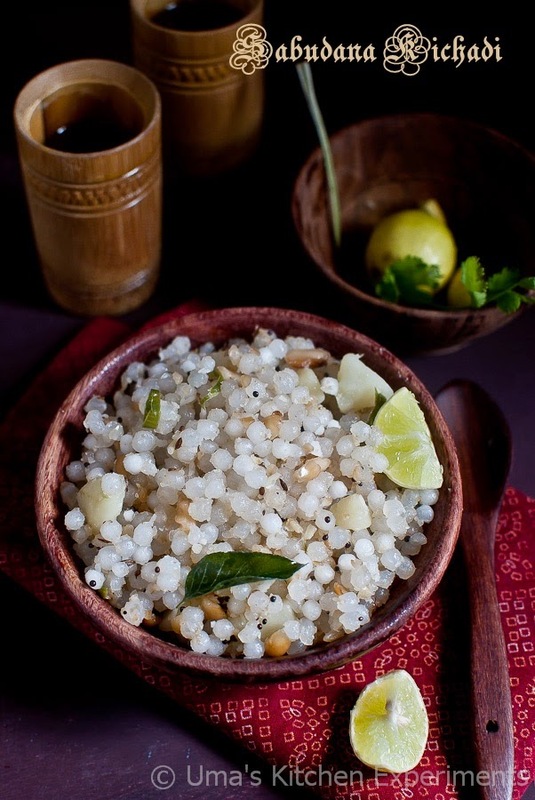 8) Add powdered peanuts and grated coconut. Mix well. 9) Just before serving, squeeze the lemon juice and serve hot. 1) If you have soaked the sabudana in more water, the next day, drain all the water and dry it in a clean kitchen towel, to absorb the excess water. 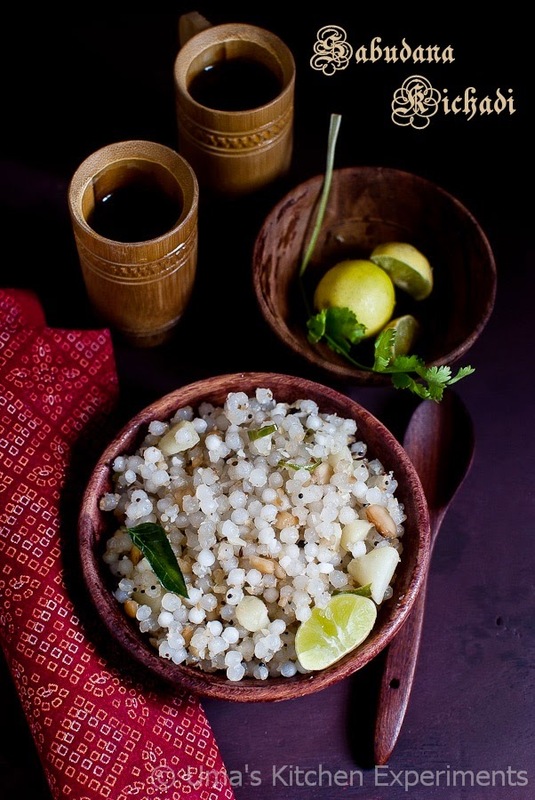 2) You may need to stir now and then to make sure all the sabudana gets cooked well and transparent. 3) Add water only if you feel the sabudana is dry while cooking. 4) I used large sabudana and soaked it over night. The soaking times varies as per the size and type. So try this kichadi with the sabudana what you usually buy. 5) 1/3 cup of peanuts is right amount for this recipe. However, you can add more or reduce it as per need. If you reduce it, feel free to add little sugar for the right taste. Looks too delicious, lovely set up there Uma.